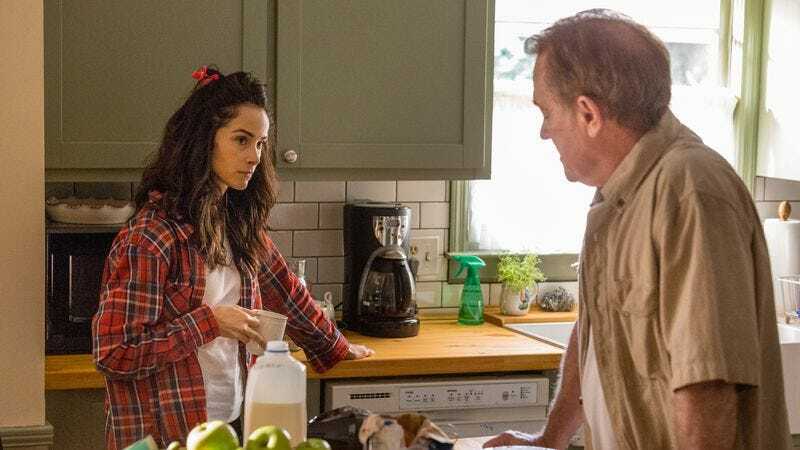 I had a queasy feeling about the final scene of “Yolk.” It makes sense that Janet would run across a newly free Trey Willis at the supermarket: It connects the incident to Amantha’s roadside conversation with Billy Harris, underlining the utter smallness of Rectify’s main setting. (“You still working at Thrifty Town?” “How’d you know that?” “You’re back in Paulie, Dorothy”) Also, Sean Bridgers’ name is in the credits, and he hadn’t shown up yet, so Trey had to be in that final scene. But the inevitability of this encounter takes nothing away from its uneasy build-up, as routine gives way to coincidence and Janet stalks her prey, J. Smith Cameron’s eyes framed by the same shelf of grits mix that cuts Bridgers off at the shoulders. I was worried about what she might say, the things that might get stirred up (to borrow a phrase from Sheriff Daggett). In our last hours together, I’m becoming overly protective of the characters on Rectify. Ultimately, she says nothing. Instead, she wreaks passive-aggressive vengeance on behalf of the son who won’t return her calls. By cracking all 12 eggs in Trey’s cart, she christens and bookends the episode—two broken shells inspire her fridge clean-out, after all—in spectacularly Rectify fashion. This act is small, like Paulie. But its impact will be deeply felt, like, well, everything else on this show. It turns out Judy Dean wasn’t the only mother Daggett needed to worry about. “A House Divided” cries out and “Yolk” echoes back, Janet’s voicemail for Daniel threading the events of both episodes together. Just as we’ve never seen Daniel Holden at home, we’ve never had a long look at what this home is like without Daniel. Aden Young’s name is missing from the title sequence, but his character’s presence hangs around, forcing his family members to seek solace outside of the Holden/Talbot residence. And that moniker has never been more apt, with Ted Jr. crashing with his dad and stepmom during the separation, and Amantha spending the night after what sounds like, in my professional opinion, the entire bottom of her car falling out. (It’s a shame that the low light of the country road prevents us from seeing this play out like a Wacky Races sight gag in which the car body remains still while the chassis rolls on without it.) But proximity breeds a desire to get some alone time, which, for Jared, takes the form of a beat-up old tent; Amantha finds hers in a weathered satellite dish, Dr. Strangelove quotes, and a joint. The sentiment is more gracefully handled through Janet, who’s so desperate for distraction, she starts with two broken egghsells and winds up with a bathtub full of refrigerator drawers. Other characters give us some additional understanding of Janet—according to Ted Sr., this isn’t her first depressive episode—which enhance the quietly powerful work J. Smith-Cameron does in the role. Janet has the closest connection to Daniel, and Smith-Cameron demonstrates this in subtle flourishes: Her reach for the oven before the fridge clean-out, the way she looks around the corner to eavesdrop on the Teds—watching other people live their lives, but not living her own. It finally breaks after Ted Sr.’s flapjack breakfast, tears streaming down her character’s face as she decides that she’s not going to send a cake to her son—she’s going to send herself. There’s so much pain in “Yolk”—Janet’s, Judy Dean’s, Ted and Tawney’s, Zeke’s—that it’s easy to overlook the episode’s signs of good spirits. All stuck-in-a-rut feelings aside, Amantha has struck up a rapport with her Thrifty Town charges, and what starts out looking like a potential slasher-film moment turns into a moment of honest connection. And then there are the scenes in which she and the Talbots nearly resemble a worry-free TV family, coming together for breakfast and encouraging Jared’s waterlogged attempt at camping out. There’s a beat between “It’s not a fad” and “All right” where studio-audience laughter and a Family Ties “sha la la la” would fit perfectly. Amantha and Teddy even get some light sibling ribbing as they talk about swapping living arrangements. But these are not the Keatons, their life is not a sitcom, and we can see through their attempts at conveying normalcy. Just look at Ted and Tawney’s date night, where Adelaide Clemens and Clayne Crawford form the outlines of a happy couple—but Mr. and Mrs. Talbots’ interactions (and living arrangements and allusions to couple’s therapy) say otherwise. Here, and elsewhere in the episode, “Yolk” communicates an absence. It’s a depiction of grieving without a death, starring people who are miles away from acceptance. Any forward momentum they make is arguably busywork: Scrubbing down the refrigerator, pitching a tent, taking a test. But Janet finds progress when she declares herself finished with waiting for Daniel to reach out. She’s going to Nashville, and she’s not going to swallow her disappointment about Trey Willis picking up some groceries at a store Daniel Holden couldn’t step foot in. Of course, Rectify being Rectify, we still feel for Trey in that situation, even as we thrill to Janet’s cathartic headway. But it’s like the old saying goes: You can’t make an omelette without cracking a few eggs. I’ve been watching Rectify for four years, and I only just realized that Luke Kirby is the hotshot American actor called in to play Hamlet in the first season of Slings And Arrows. I’ll leave my TV critic credentials at the door on the way out. The supermarket scene isn’t “Yolk”’s only moment that tensely builds toward the inevitable: Everything about Amantha’s nighttime drive signals oncoming auto trouble. The darkened road, the intoxicated driver, the ironic soundtrack choice. As soon as that “Build Me Up Buttercup” intro kicks in, it’s not a matter of “if” Amantha’s going to get into a wreck—it’s how. I had my money on symbolic road kill, so the car falling to pieces was a bit of a relief.